Aluminum is a near perfect metal for outdoor furniture as it cannot rust, is lightweight and is durable. The aluminum used by Skyline Design is powder coated and 1,8mm to 3mm thick, which ensures a surface resistant to knocks and scratches. Due to its inability to rust, our aluminum furniture is ideal for seaside use. Carefree maintenance we recommend washing it down regularly with warm soapy water. Teak has all the attributes needed for excellent outdoor furnishings. It resists decay, repels water, doesn’t shrink or swell, ages well, and is incredibly strong. Teak’s secret lies in its tight grain and natural oils. The limited absorption of moisture protects the wood from warping. In order to maintain the teak is recommended to clean the surface with water and neutral soap. It is also recommended the application of specific oils for Teak in order to renew its natural softness and moisture. Do not use products with alcohol or chemical substances. High-density polyethylene wicker developed to meet all standard specifications for outdoor furniture. This weaving material offers a carefree outdoor furniture, UV resistant, weatherproof and temperature resistant, strong and durable, colorfast, scratch-free easy to clean, environmentally friendly and 100% recyclable. Is made from different blends of thermoformed plastics, UV-inhibited pigment systems, foaming compounds, and selected process additive. Polywood has exceptional resistance to corrosive substances such as oil, salt spray and other environmental stresses. Products made with Polywood has exceptional resistance to corrosive substances such as oil, salt spray and other environmental stresses. Products made with Polywood have excellent weathering resistance and requires no maintenance when used in outdoor applications. Innovative fabrics designed to withstand all types of weather, ideal for both indoor and outdoor applications. Sunbrella fibers are steeped in top quality dyes during the manufacturing process making it ultra-durable. The finishing treatment applied to all Sunbrella fabrics repels liquids and dirt, making them extremely easy to keep clean. Sunbrella fabrics can be machine washed at 40°C. Fabrics covers that cannot be removed for washing can be cleaned with a soft-bristle brush and soapy water. Rinse with clear water and let air dry. 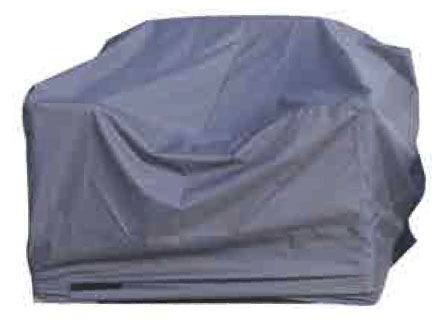 Skyline covers are backcoated to resist water, oil and dirt, functioning to protect the furniture. There are not recommended as a permanent cover for cushions, as moisture may collect and lead to the formation of mold stains. Furniture and cushions should b thoroughly dry before using the covers. Please note that the covers are especially tailored to your furniture item and precise placement is required (indicates by the yellow or brown piping). Never pack or fold covers that have become wet; instead, let them dry in a well-ventilated place. Use a soft clorth and warm water to clean the covers, using a gentle upholstery cleaner if necessary. Solvents are not suitable for cleaning the covers as these are aggressive to the surface and may cause damage and discoloration. Skyline design Asia Pacific Marketing PTE LTD Copyright ©. All Rights Reserved.